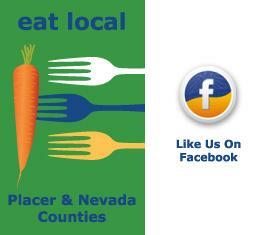 Welcome to the Placer and Nevada Counties' resource for eating local. Our goal is to provide you with the information you need to get started eating locally produced food. Why eat local? There are numerous reasons to eat locally produced food. Key among them is the variety, freshness and overall flavor you just can't find at the supermarket. Eating locally allows you to connect to your local agricultural community by building relationships with local farmers and ranchers, while learning about the seasonality of foods. Not sure how to begin? 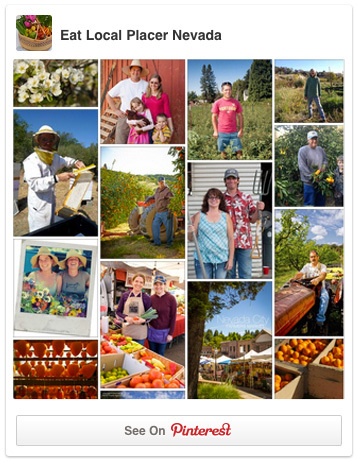 To assist your explorations of our local food supply, check out our Local Farmers page, and Seasonal Buying Guide. Included are links to local resources, nutritional information, and pages devoted to the over 100 products you can find locally. Find Your Local Farmers’ Market! Spring is here and the Farmers Markets are Open!